This week's photo shows Tomás Ó Faoláin, Secretary of the Sheehan Cup Committee, presenting the prestigious primary schools' hurling trophy to the Abbeyside National School team that defeated Ballygunner at the Showfield in Dungarvan in 1957. Some players pictured include A. McGovern, P. Enright, J. Regan, J. Breen and T. Leahy (Capt.). Also included are Michael Foley who trained the team and Michael Fives. The draws for the Western Hurling and Football Championships took place at this evening's Western Board Meeting. Our ever popular Jack the Joker fundraiser continues this Sunday night in Alice O’Connor's where the jackpot is €2,000 as on Sunday night last Stephen Prendergast was drawn out of the drum and chose card number 35, which when turned was the Joker so Stephen collects the Jackpot of €8,800. Martina Barry and Jim Egan won €25 each. As well as our group of ticket sellers tickets can be purchased from Convenience Store Ballinroad, Village Flowers, Spar, Mousies Takeaway, Minnies Bar and Crotty’s Corner Bar. Once again this year the GAA are holding a National Draw with tickets costing €10 each. There are some fantastic prizes on offer. Tickets are now available from Committee members and team managers. This Saturday evening at 7:30pm we will hold our Medal Presentation evening in Scoil Mhuire Hall, where all club members and supporters are most welcome to attend. On the night we will be presenting medals to our Minor Hurling and Football side who won both County Titles, to our Under 21 Football team who won the Western Title and to our Junior Footballers who won the Western and County Titles. This promises to be a most enjoyable evening and once again all are welcome to attend. If any member of the club would like to receive texts from club secretary Jonathan O’Donovan informing them of the death of club members or other items of club information they should contact Jonathan by this Sunday evening. We would like to remind intending members and especially players that membership fees are now due and can be paid to Kevin Tobin or any team manager. We would ask players to make a special effort to pay their membership before returning to training to ensure they are covered by insurance. As teams start back training over the next few weeks we remind all team managers that they must book the pitches / astro turf with Michael Donovan prior to training and also managers are asked to remember that the main pitch remains closed until further notice. Our club bingo will continue this Sunday night in the CBS Hall with a jackpot of €750. Under eleven football training continues this Friday night between 6 and 7 pm. New members are always welcome and membership forms will be handed out on the night. The underage outdoor hurling season is nearly upon us again. The season starts on February 20th 2016 for anyone between the ages of 5 and 10. New members are always welcome and hurleys and helmets will be available on this date for new members. These sessions will be weekly on a Saturday morning between 10.30 am and 11.30. The next two Saturdays after this date which are February 27th and March 5th will be allocated as membership days where we hope to collect all the membership for the relevant age groups. Under 10 training will resume this Friday night, 29th January in the wall ball between the times of 7 and 8 pm. The under 13 age group were due to start on this night also but because some of the lads are receiving medals at the medal presentation the starting date for this group has been put back a week to Friday, 5th February between 8 and 9 pm. We apologise for any inconvenience caused. We will hold a medal presentation this Friday night the 29th January in Ballinroad Hall at 7.30pm sharp for last year’s under 13’s, 14’s, 15’s and 16’s. All these age groups will receive medals on the night which is a great achievement for all involved. We will have two special guests on the night to present the medals and this should be a very enjoyable evening for all involved. We ask all parents could they bring along light refreshments like cakes buns etc for after the medal presentation. All within the club and of course parents and siblings are encouraged to come along to make the occasion special for the lads collecting medals. The draws for the 2016 Senior Hurling and Football Championships were held at tonight's County Board Meeting. Our ever popular Jack the Joker fundraiser continues this Sunday night in Minnies Bar where the jackpot is €8,800 as on Sunday night last Thomas Fitzgerald was drawn out of the drum and chose card number 52 which wasn’t the Joker although he did win €50. Kitty Farrell and Jim Egan won €25 each. As well as our group of ticket sellers tickets can be purchased from Convenience Store Ballinroad, Village Flowers, Spar, Mousies Takeaway, Minnies Bar and Crotty’s Corner Bar. If any member of the club would like to receive texts from club secretary Jonathan O’Donovan informing them of the death of club members or other items of club information they should contact Jonathan over the next two weeks. Our club bingo will continue this Sunday night in the CBS Hall with a jackpot of €700. Under eleven training continues this Friday night between 6 and 7 pm. New members are always welcome and membership forms will be handed out on the night. Our underage outdoor hurling season is nearly upon us again. The season starts on February 20th 2016 for anyone between the ages of 5 and 10. New members are always welcome and hurleys and helmets will be available on this date for new members. These sessions will be weekly on a Saturday morning between 10.30 am and 11.30. The next two Saturdays after this date which are February 27th and March 5th will be allocated as membership days where we hope to collect all the membership for the relevant age groups. Under 10 and Under 13 hurling training will resume on Friday week the 29th January in the wall ball. The under 10 age group will run between the times of 7 and 8 Pm and the under 13 age group between the times of 8 and 9 pm. All are welcome. We will hold a medal presentation on Friday week the 29th of January in Ballinroad Hall at 7.30 pm sharp for last year’s Under 13’s, 14’s, 15’s and 16’s. All these age groups will receive medals on the night which is a great achievement for all involved. We will have a special guest on the night to present the medals and this should be a very enjoyable evening for all involved. Light refreshments will be provided after the medal presentation and all within the club and of course parents and siblings are encouraged to come along to make the occasion special for the lads collecting medals. Following our juvenile AGM in late 2015 the following positions have been filled on our Juvenile Committee for 2016. Other members of the committee include Damian Cliffe, Michael Enright, Eamon Lonergan, Justin Walsh, Benny Flynn and Mark Lubek. Back Row (L to R): Jim O'Mahony, Paudie Donnelly, John O'Driscoll, Richie Ryan, Anthony Flynn, Seán O'Hare, Stephen Lanigan, Diarmuid O'Hare, Eoin Brackett, Daryl Ryan, Patrick Hurney, Mark Ferncombe, John Gorman, Mark Gorman, Bernard Gorman, Michael Collins. Front Row (L to R): Donal Henley, Stephen Enright, Jamie Ryan, Mark Fives, Brian Scanlon, Richie Foley, James O'Mahony, Brendan Walsh, Joey Mullen, Tiernan Murray, John Kindregan, Alan Tobin, Pajo Lanigan. This week's photo shows the Abbeyside panel and management team that won the 2007 County U21 'A' Hurling Championship at Walsh Park following their 1-18 to 1-17 extra time victory over De La Salle just three days before Christmas. This win secured the club's third title at this grade in four years. Our ever popular Jack the Joker fundraiser continues this Sunday night in Minnies Bar where the jackpot is €8,600 as on Sunday night last Mai Donnelly was drawn out of the drum and chose card number 13 which wasn’t the Joker although he did win €50. Pat and Kiera and Ray Spratt won €25 each. As well as our group of ticket sellers tickets can be purchased from Convenience Store Ballinroad, Village Flowers, Spar, Mousies Takeaway, Minnies Bar and Crotty’s Corner Bar. Our club bingo will continue this Sunday night in the CBS Hall with a jackpot of €650. Under 11 training gets underway this Friday night between 6 and 7 pm. New members are always welcome and membership forms will be handed out on the night. This week's photo shows players, supporters and officials on a victory tour of Abbeyside following Ballinacourty's County Senior Football Championship win over Clashmore in 1978. 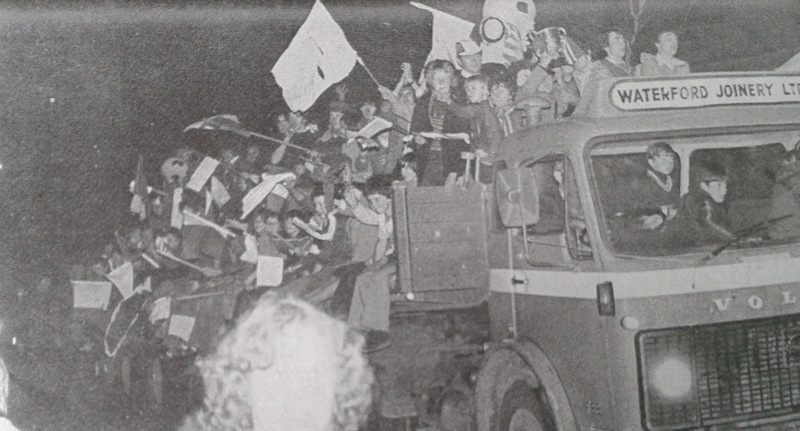 Here Mrs. Biddy Flynn, Club Vice-President, holds the Conway Cup aloft as the lorry passes through Murphy Place. Our ever popular Jack the Joker fundraiser continues this Sunday night in Minnies Bar where the jackpot is €8,400 as on Sunday night last Pakie Hurney was drawn out of the drum and chose card number 16 which wasn’t the Joker although he did win €50. Ken and Jim and Barbara Clancy won €25 each. As well as our group of ticket sellers tickets can be purchased from Convenience Store Ballinroad, Village Flowers, Spar, Mousies Takeaway, Minnies Bar and Crotty’s Corner Bar. On behalf of all in the club we would like to congratulate Patrick Hurney and Emma Susan Ryan who were married last weekend. We wish them both many years of happiness together. Our club bingo will continue this Sunday night in the CBS Hall with a jackpot of €600. On behalf of all in in the club we would like to extend our sympathies to the family and many friends of the late Liam Byrne, Clonea Road, Abbeyside who passed away over the weekend. For generations the Byrne family have given wonderful support to our club and continue to do so today. Once again we send our sympathies to Kitty, Ger, Honor, Johnny and Kay on their sad loss. We would also like to send our sympathies to the family of the late Anthony Hayes, Ballinroad who passed away over the Christmas period. 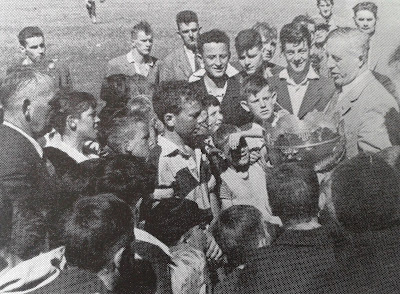 This week's photo shows Waterford County Board Vice Chairman, Pat Flynn presenting the County Minor 'A' Football trophy to Séamus Lavan following Ballinacourty's hard fought 0-11 to 1-6 victory over Gaultier in the County Final played at Kill GAA Grounds in November 2002. This win secured back-to-back titles at this grade while three in a row would be secured in 2003.